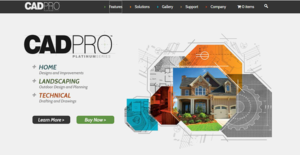 CAD Pro is a powerful, money-saving computer-aided design (CAD) solution designed for all areas of CAD design and engineering including technical drawing & drafting, home design & improvement, and landscaping design & planning. The software provides smart, patented tools and symbols that aid creation of any project while eliminating the need for separate products. It offers interactive features that enable users to insert popup text notes, images, and precise audio files or verbal comments. The application provides an effortless way to create detailed blueprints for your patent design. It’s easy to learn and use thanks to its straightforward toolset which include advanced drafting tools, smart dimensioning tools, smart design tools, photo plugin, auto snap, sketch tracing, paint pro plus, auto shape tools, architectural tools, gradient fill colors, 256 layers, customizable views, and detailed fill patterns. CAD Pro is reliable CAD system designed to aid the creation of detailed blueprints. It provides a wide range of design tools that serve beginners and professionals alike. Its toolset complements its simplicity allowing all types of users to create perfect projects for deck designs, house plans, landscape blueprints, mechanical drawing, and much more the easy way. The dimension module works in tandem with the precise snap tools to deliver smart and accurate designs. The snap tools are expertly crafted to automatically align or locate parallels, perpendicular, tangents, intersections and much more. They deliver the power of inimitable accuracy for all your drafting needs making precision drafting simple and automatic. Also, the snap tools are quickly accessible and can be customized and relocated to any place on your home screen for increased convenience. CAD Pro provides a comprehensive list of interactive features made for different uses. These features allow you to easily insert popup images, text notes, and precise audio files or verbal comments. When incorporated correctly in your designs, the features eliminate the discrepancies that might arise as you present the design ideas. The PaintPro Plus is CAD Pro’s easy to use photo editor that provides a smart way to incorporate digital images into any drawings. The module enables you to open digital images/photos, edit them, and add special effects before placing them in your drawings on CAD Pro. This provides a special way to express your project ideas with authentic images of the design requirements. If you are considering CAD Pro it could also be beneficial to examine other subcategories of Best CAD Software collected in our base of SaaS software reviews. Companies have diverse needs and requirements and no software application can be just right in such a condition. It is pointless to try to find a perfect off-the-shelf software product that fulfills all your business requirements. The smart thing to do would be to adapt the system for your unique requirements, employee skill levels, budget, and other aspects. For these reasons, do not rush and subscribe to well-publicized trendy systems. Though these may be widely used, they may not be the perfect fit for your specific needs. Do your homework, investigate each short-listed system in detail, read a few CAD Pro reviews, contact the maker for explanations, and finally select the application that provides what you require. How Much Does CAD Pro Cost? The vendor has a simple enterprise pricing structure that involves a single, one-off pricing of $89.95. We realize that when you make a decision to buy CAD Software it’s important not only to see how experts evaluate it in their reviews, but also to find out if the real people and companies that buy it are actually satisfied with the product. That’s why we’ve created our behavior-based Customer Satisfaction Algorithm™ that gathers customer reviews, comments and CAD Pro reviews across a wide range of social media sites. The data is then presented in an easy to digest form showing how many people had positive and negative experience with CAD Pro. With that information at hand you should be equipped to make an informed buying decision that you won’t regret. What are CAD Pro pricing details? What integrations are available for CAD Pro?